← No Homework Policy ! Islam forbids human or animal figures be used in decoration. It is their belief that God alone has the power to create life. 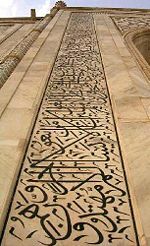 Today, I am showing you images from the artistic decorative elements of the Taj with marble, semiprecious stones, carvings, and calligraphy and all created in the 16 C to be a burial monument for the beloved queen. Some of the 2013 students , actually most of them, spent the whole day in the Garden of Paradise, filming, sketching and just observing the changes of color and light . This was amazing as no food or water is allowed on the grounds and no, not one, persistent beggar or vendor. It did seems like paradise. When we went back in 2015, pens and or pencils were confiscated meaning no sketching. As they had grown to really enjoy the sketching. this was a huge disappointment. We only stayed 2-3 hours the second time. This is a beautiful video for those with interest and time! David always says there is a reason sites are so full of tourists.. . . because they, the sites, are so special. I hope you have had a tiny taste of this, one of the the most spectacular buildings in the world still today, built hundred of years ago. This entry was posted in Architecture, India, Religions of the World, Travel, Uncategorized and tagged 16 C Mogul architecture, Agra, architecture, calligraphy, carving, decorative detail, flowers, Garden of Paradise, India, Islam, love story, marble, religion, Religions of the World, sacred architecture, screens, Taj Mahal, trees. Bookmark the permalink. Well, that is a great question ! No one told us why but we figured the marble and beautiful carvings and semi-precious stones could be damaged with them. That was all we could think of ! There is no eating or drinking on the grounds now and so no rubbish. . . lovely really!